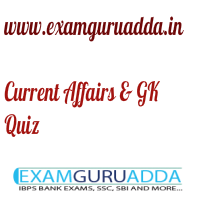 Dear Readers Examguruadda.in presents Current Affairs quiz of 21-22th December 2016 that cover important current affair events. Current Affairs quiz for IBPS PO,clerk, RRB-Po,Clerk, SBI, NIACL,Railways and SSC Exams. 1. The National Mathematics Day (NMD) is celebrated on which date in India? 2. Which country’s football team has won the 2016 FIFA Team of the year title? 3. “Pratikar-I” the first-ever joint military exercise will be held between Nepal and which country? 4. Who has won the 2016 Kids Golf World Championship? 5. For the first time in nearly 150 years, India's economy surpassed the economy of this country? 6. The book “Parijat” has been authored by whom? 7. Majuli island is located in which state? 8. India’s first cashless bazaar was launched in which state? 9. Who will head the newly constituted high-level task force on Indus Water Treaty (IWT)? 10. Which famous personality has launched book series “Tactabet” for visually impaired children?